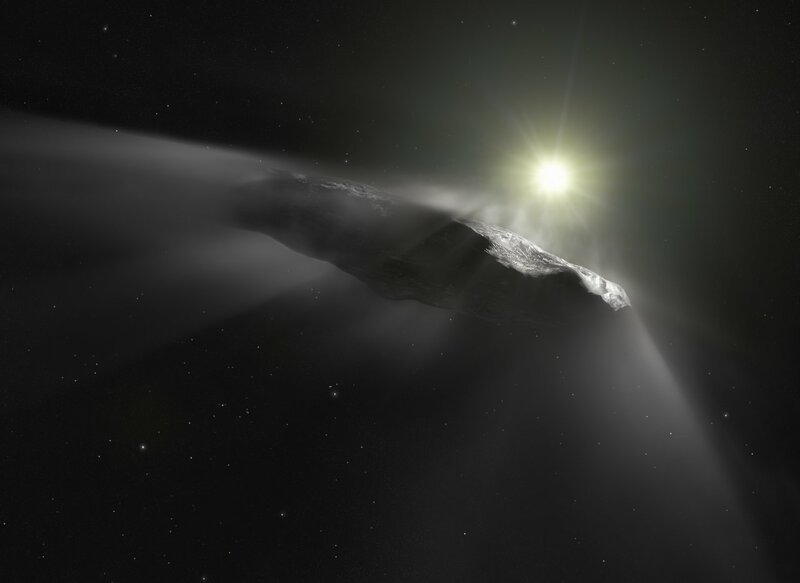 Is ʻOumuamua Really a Comet? The interstellar object ʻOumuamua was discovered back on Octobter 19, 2017, but the puzzle of its true nature has taken months to unravel, and may never be fully solved. Meaning ‘scout from the distant past’ in Hawaiian, ‘Oumuamua was found by astronomers working with the University of Hawaiʻiʻs Pan-STARRS1 survey as it came close to Earth’s orbit. But what is it? an asteroid, a comet or a rock that just happens to be passing by? As soon as it was spotted, astronomers from around the world were on the case. The first clue: its trajectory. Extensive follow-up observations by the Canada-France-Hawaii Telescope (CFHT), the European Space Agency’s (ESA) Optical Ground Station telescope in Tenerife, Canary Islands, and other telescopes around the world have helped pin it down. ‘Oumuamua was first spotted about a month after its closest approach to the Sun, which took it within the orbit of Mercury. 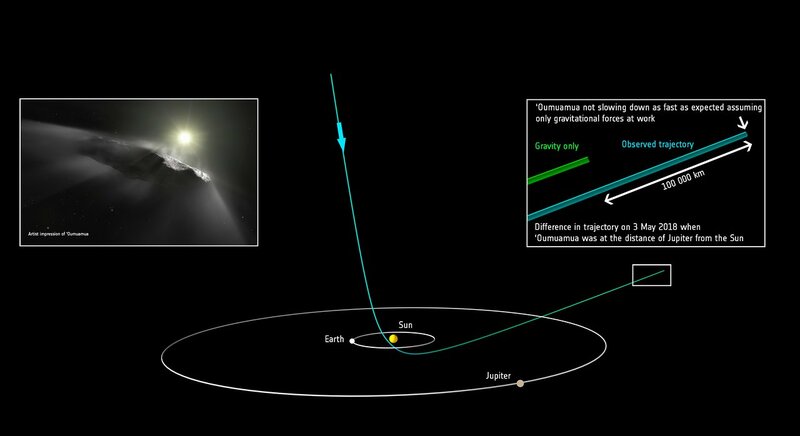 Unlike any asteroid or comet observed before, this new object sped past the Sun, approaching from ‘above’ the plane of the planets on a highly inclined orbit, moving fast enough (70,800 miles per hour as of July 1, 2018) to escape the Sun’s gravitational pull and eventually depart our Solar System. Initially, astronomers assumed ‘Oumuamua was a comet. Current understanding of planet formation predicts more interstellar comets than interstellar asteroids. However, astronomers did not see evidence of gas emission or a dusty environment in the observations. Without these hallmarks of cometary activity, it was classified as the first interstellar asteroid. But the story has another surprising twist. Following the initial discovery observations with Pan-STARRS, a team of astronomers led by Marco Micheli of ESA’s SSA-NEO Coordination Centre, and Karen Meech of the University of Hawai‘i Institute for Astronomy, continued to make high precision measurements of the object and its position using many ground-based facilities like CFHT, as well as the Hubble Space Telescope. The final images were taken with Hubble in January, before the object became too faint to observe as it sped away on its outbound orbit. Contrary to their expectations, the team found that the object was not following the anticipated trajectory if only the gravity of the Sun and the planets were determining its path. "Unexpectedly, we found that ‘Oumuamua was not slowing down as much as it should have due to just gravitational forces", says Marco, lead author of the paper reporting the team's findings,published today in the journal Nature. What could be causing this curious behavior? Comets contain ices that sublimate, or turn directly from a solid to a gas when warmed by the Sun. This process drags out dust from the comet’s surface to create a fuzzy ‘atmosphere’ and sometimes a tail. The release of gas pressure at different locations and times can have the effect of pushing the comet slightly off-course compared with the expected path if only gravitational forces were at play. “Thanks to the high quality of the observations we were able to characterize the direction and magnitude of the non-gravitational perturbation, which behaves the same way as comet outgassing” says Davide Farnocchia of NASA’s Jet Propulsion Laboratory.